You may of been driving around in a 1960 Humber Hawk Series II while lower budgets enjoyed the 1960 Austin Mini Seven rather than the Aston Martin DB5. Here are some other memories we enjoyed in the year of 1960, feel free to add your memories at the foot of the page. This was the year Dr. Martens set off and eventually made a big name for itself in the fashion world. 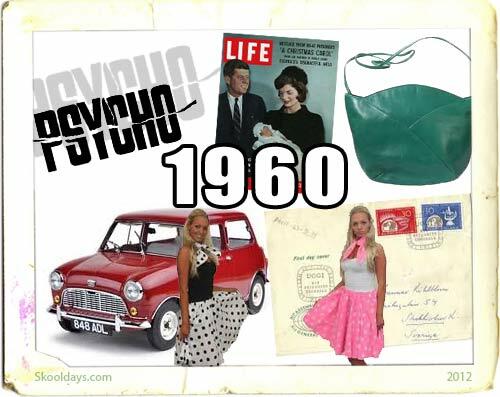 Did you prefer a 1960 Russell & Bromley Green bag as your fashion accessory for a night at the dance hall? Toys such as Hornby trains were in ever boys bedroom along with meccanno and other lovable games and toys. Also making it popular in the year of 1960 was the Johnny Eagle gun. Some may remember counting with Hi-Ho! Cherry-O, or Spudsie the Hot Potato. You could also be entertained with the Fun Phone, anyone remember that? Other hits were the plastic-bodied robot called Mr. Machine. For those that couldnt drive a mini they could scale down to Scalextric Triang They released a 1960’s Mini Racing set that kept boys and dads entertained. If you wanted to hear the hits, then tuning in to the Pirate Radio Luxembourg on 208 Medium Wave was a must. True the signal would fade on and off, but you did get a great radio station with all the hits. This was the year you may of watched Maverick with Beau Maverick (1960-61) Gentleman Jack Darby Richard Long Doc Holliday (1960-62) . Other shows included Let’s Have Fun. Though in the USA one show that caught everyone’s attention was the first televised presidential debates. Anyone remember The 1960 Children’s Film Foundation program called Hunted in Holland? A lad goes to stay with his Dutch pen pal and accidentally falls foul of a tourist guide on his way across. This guide is one of a gang smuggling stolen diamonds into Holland; a bracelet is hidden in his walking stick and they discover this. It was repeated a few times thereafter, but made great TV in that year. This entry was posted in Arcade, Cartoon, Fashion, LunchBox, Movies, Pop Culture, PopMusic, PrimeTime, Saturday, Toys and tagged 1960 by Skooldays. Bookmark the permalink. In 1960 The Apartment was also released – With Jack Lemmon – A man tries to rise in his company by letting its executives use his apartment for trysts, but complications and a romance of his own ensue.Anyone else remember this movie?